Ever since going to Veselka in New York, I’ve had a craving for Eastern European food. That’s where Prague Fine Food Emporium came in. While reading their menu online, I was drooling over the thought of their special – the pork hock. Chris and I arrived on a Thursday evening for dinner. Open for forty two years, they only recently began serving dinner from their new “Bistro” menu – but only from Thursdays to Saturdays. 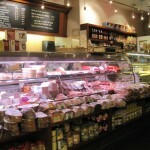 Half of the space is catered to their take-out customers as it consists of a large deli counter. The other half of the restaurant has a warm, cozy feel to it for the customers eating in. After deciding on what to order, I was informed they were sold out of pork hock. How disappointing! Both Chris and I were so excited to try it. Sadly the other dish I wanted to order, the borscht soup, was also sold out. Guess we have to get there early for the good stuff. 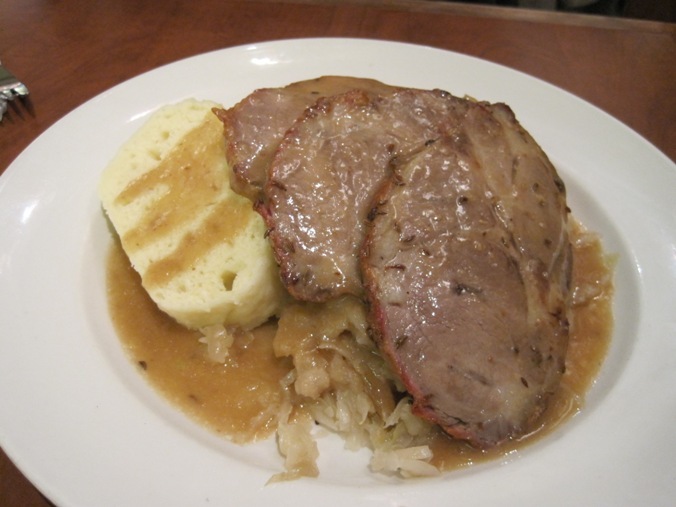 We decided to go for another pork dish, the Czech Style Roast Pork – Pan jus, braised white cabbage, bread dumplings ($14.50). The edges were still crispy and the meat was moist, tender and full of flavour. Sure, it’s no pork hock, but boy was this still incredibly satisfying. I’m not typically a huge fan of sauerkraut, but the side of cabbage that came with the dish was also quite nice. I ended up eating a lot of it since it paired so well with the pork. The bread dumplings were thick slices of steamed white bread which we used to soak up all the gravy. Chris and I both really enjoyed this dish. 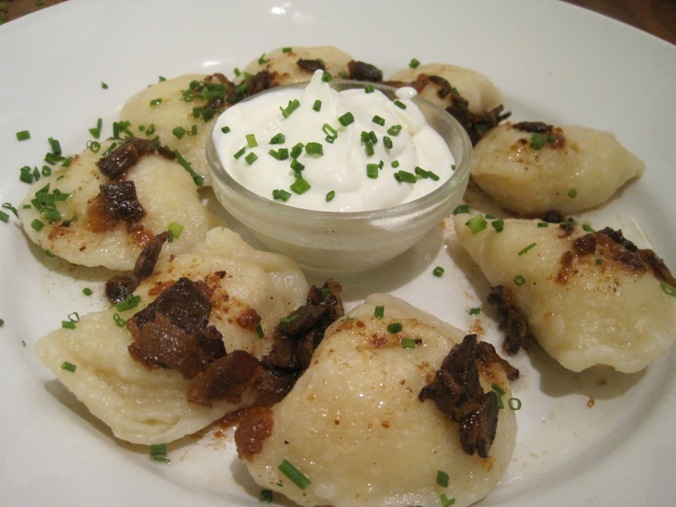 We also ordered the Polish Style Cheese Perogies – sour cream, bacon and caramelized onions ($9.90). 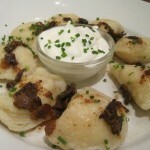 These plump perogies were delicious. They were cooked well – the skin still had a bit of bite to it which I prefer and the creamy filling had a great flavour. The perogies were topped with plenty of bacon but unfortunately, not a whole lot of caramelized onions. They were also served with a side of sour cream which I didn’t use very much of. The perogies tasted great on their own. Now, how did these perogies compare to the ones at Veselka? 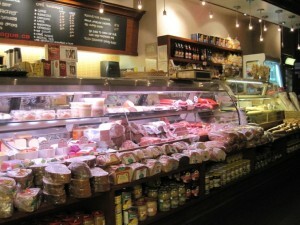 Prague Fine Food Emporium definitely does them better. 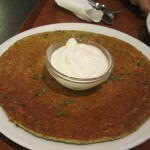 Since we were starving, we also wanted to order a Potato Pancake . We initially asked for the full order for $6.50 but the server thought there’d be too much food so he told us he’d ask the kitchen to prepare a single large pancake for us for only $2.50. He informed us that the full order comes with several smaller pancakes. It’s a good thing we went with his recommendation since we couldn’t even finish our smaller order. The potato pancakes come with sour cream or apple sauce, which was an extra $0.75. Since we were unsure what would taste better, the server recommended the sour cream. I was actually expecting a latke – fried and crispy. However, the texture of this was more like an actual pancake. I found it to have a strange flavour which I couldn’t quite pinpoint. 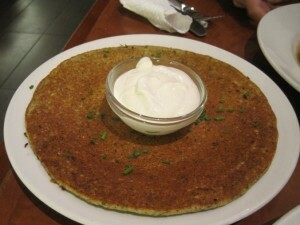 Even when paired with the sour cream, I didn’t really enjoy the pancake. I wouldn’t order this again. Overall, we had a great experience here. 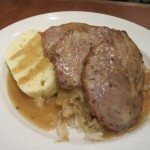 I loved the roast pork and perogies. The service was also great – our server was polite and despite him seeming a little overwhelmed at times (as it was quite busy this evening), he was very helpful. If I wasn’t so full, I would have tried one of their homemade desserts which include strudel and a variety of Palačinky (a dessert which resembled crepes). I’ll definitely be saving room for them next time I come – after the pork hock. I am afraid to tell you this amazing place does not exist anymore. It has changed owner, and has a totally different menu. It was a great eatery, with great comforting and flavourful food. All of that is gone. Just the name remains. Oh no. That’s such a shame…I really enjoyed what they had to offer. I knew they had recently renovated but didn’t know about the change in owners or the menu revamp. Thanks for sharing!